Do You Eat First or Exercise First? When you decide to develop your physique with a weightlifting routine, the exercise portion is only half of the equation. The foods you eat also play a big role in the muscle building process. Consuming specific foods before each workout gives you the energy you’ll need to keep your intensity levels high and maximize results. When you work out, your body taps into its existing stores of glycogen and fat to provide energy, says Mark Strasser, MS, CSCS. When you eat the right type and proportions of food before your weight-training workout, you provide your body with all the glycogen and fuel it needs for an intense training session. If you run out of energy during a workout, your results will be sub-par, and you run the risk of injuring yourself. You want to include protein in every meal when lifting weights, but to fuel your training, the majority of your pre-workout meal should come from carbohydrates. According to the Gatorade Sports Science Institute, two-thirds of your plate should be filled with carbohydrates for quick energy during the training session. Try combinations like a turkey sandwich on whole grain bread with tomatoes and lettuce, a steamed or grilled fish fillet with rice, or a melon and berry salad with cottage cheese. 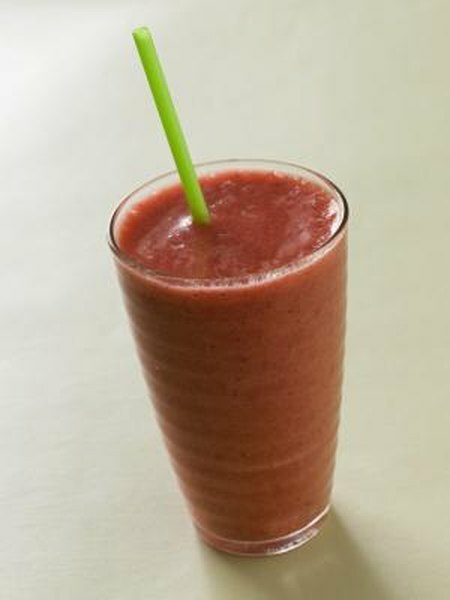 If you don’t have much time, and want something that will break down faster than solid food, try a smoothie or shake. Add fresh or frozen fruits like berries, melon or banana to a blender, then add juice or water and protein powder or cottage cheese, then blend it into a shake. Observe the two-thirds carb rule with your pre-workout smoothies, as well. Hydration is just as important a part of your pre-workout routine as the food, so remember to drink adequate fluids before you lift. Drink two cups of water two to three hours before, then another cup about 20 minutes before to ensure you won’t be dehydrated. Don’t consume foods that are high in fat before a workout, or you’ll end up feeling sluggish and unmotivated. Also, don’t consume refined sugar products like soda or candy as your energy source, or you may experience an energy crash during the workout. When You Exercise Should You Do Cardio or Strength Training First?